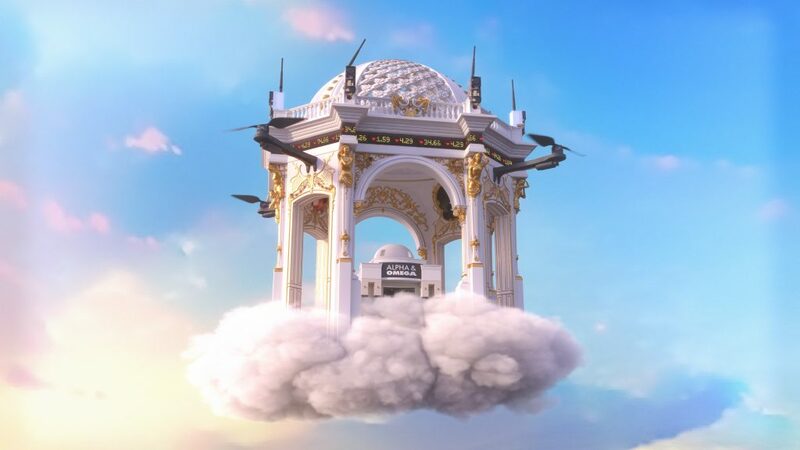 Jonathan Monaghan, Out of the Abyss,2018, video (color, sound) media player, projector or monitor, 19 minute continuous loop. Courtesy of Bitforms Gallery, New York. A Trace Left by the Future is a solo exhibition by Washington D.C. based artist and VisArts Studio Fellow Jonathan Monaghan, featuring new sculpture, video, print and installation work. Monaghan invites us into a candy-colored, yet unsettling world uncovering fears and anxieties about an increasingly technological future. Premiering for the first time is Out of the Abyss, a 19 minute seamlessly looping video installation referencing symbols and narratives associated with the Apocalypse. Visually extravagant, the work re-imagines elements such as the seven-eyed lamb and the four horsemen as terrifying beasts of the present day, adorned with security cameras, riot gear, and consumer electronics. Also presented are new print and wallpaper works depicting ominous forms composed of designer fabrics and ambiguous technological contraptions. These cryptic works draw attention to the increasingly blurry lines between the natural and artificial. About the artist: Jonathan Monaghan (b. 1986, Rockaway Beach, New York) works across print, sculpture, and video installation. Drawing on a wide range of sources, from science fiction to Baroque architecture, he creates bizarre, yet compelling narratives and imagery with the same high-end technology used in Hollywood or by video game designers. Past exhibitions of his work include The Sundance Film Festival, The Walters Museum of Art, The Frist Art Museum, and The Palais de Tokyo. About the VisArts Studio Fellowship: The VisArts Studio Fellowship provides a unique opportunity for a dynamic individual artist or collaborative artist team to create a new body of work, evolve an existing body of work, or develop a project in a stimulating, supportive environment over a six-month period. Studio space is provided free of charge and artists receive a monthly stipend. The Studio Fellowship offers the gift of time and space to two artists and/or collaborative artist teams each year to experiment and realize new work. The VisArts Studio Fellows present their work in solo exhibitions at the end of their respective fellowships. Learn more about the VisArts Studio Fellowship.